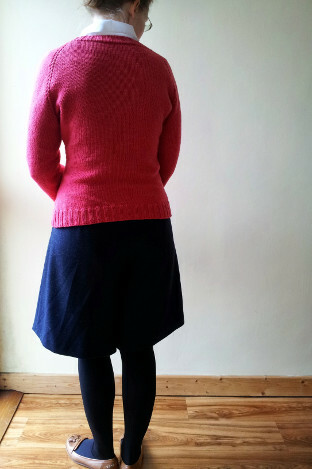 I realised in my last Knitting round-up that I never got proper photos of my Pomegranate sweater. 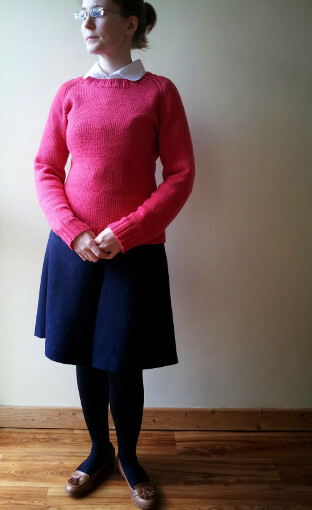 Last shown here at the beginning of last April, this was a pleasant spring knit. I started out wanting to knit the ‘real’ Pomegranate sweater. I loved the colour and was thrilled to find something similar in Debbie Bliss Rialto DK (now discontinued I think?!). Sadly, the pattern was way, way beyond my attention span at the time. I think it is definitely something I will come back to but it wasn’t going to happen then. So, I just knit a top-down raglan a la Barbara Walker and used yarn overs for the raglan decreases. A few waist decreases and increases, long sleeves, basic round neck, absolutely run-of-the-mill. I’m really happy with how it turned out and the colour makes me really happy. It goes well with navy and grey, which are two colours I wear a lot too. 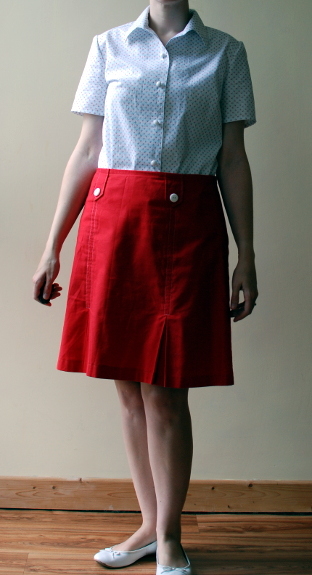 I have it on here with a white blouse and navy culottes that I wrote about here. It’s funny that I wrote recently that I haven’t felt much need for sweater knitting given my well-appointed sweater shelf. Ever since then, I’ve been full of ideas! A series of neckline problems in my last few projects culminated on Sunday with this one. Quite a while ago, I stumbled upon a bridal fabrics sale in Hickey’s and bought a metre each of very fine quality ivory and black silk, as they were marked down from €60/m to €20/m. I thought they would make very pretty tops, given their luxurious sheen and amazing drape, but always passed on making them up for fear of failure. Last week, I decided to bite the bullet and dreamt up a little tank top with a pleated neckline. 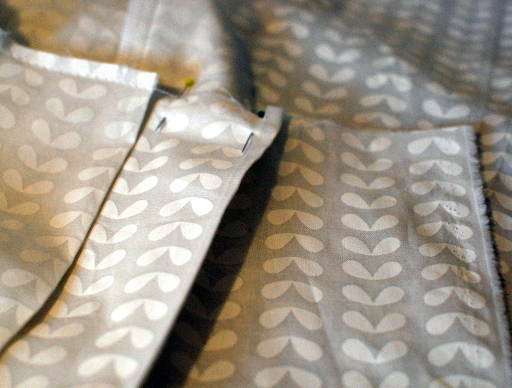 I scoured the internet for pattern resources and failing to find any to suit my fabric, made my own. 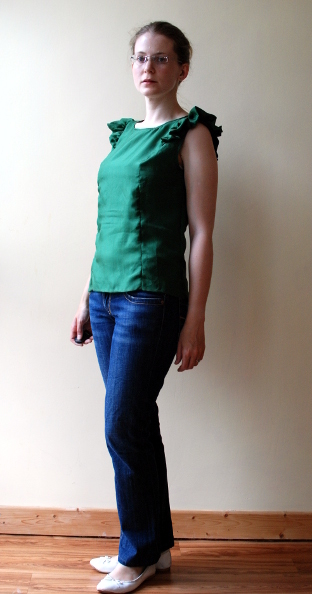 I took the basic block from the pattern that I used for this, an old Burda magazine pattern. I like it because it works really well for drapey fabrics. I did a little research and decided my best plan of action was to move the dart at the side to the neckline and turn it into the pleats. A little tracing and a quick muslin proved I was on the right track. I dislike seamlines showing on armholes, especially for light fabrics, so I cut out some left over habotai lining to line the whole thing. I sewed the lining to the neckline first of all but quickly realised that the weight of my pleats were always going to pull the lining to the outside, no matter what I did. I undid my stitching and was clipping the curve in the seam allowance along the front when I did the unthinkable: I snipped into a tiny fold that had caught up into the curve and there it was. A hole in the front. Really, in a situation like this, only knitting can be the remedy. So I retreated and knit (and watched Fatal Attraction, an old Michael Douglas movie that has a frankly terrifying Glenn Close in it) and when I felt calm enough to approach the top again, I saw three things clearly that made me quite happy. The first is that the hole is not very big nor very far from my original seamline. If I make the neckline a little wider, I will be able to encompass the little hole into the seam allowance. The second is that the original neckline was so narrow that it needed an opening – widening the neckline eliminates having to deal with that. The third is that this situation made me face the reality that no amount of fussing around was going to make the pleats lie properly with the lining and that I should just use a narrow bias. Obviously, I am going to need to redraft the neckline but it’s not a big job and at least my top will be rescued. Phew! 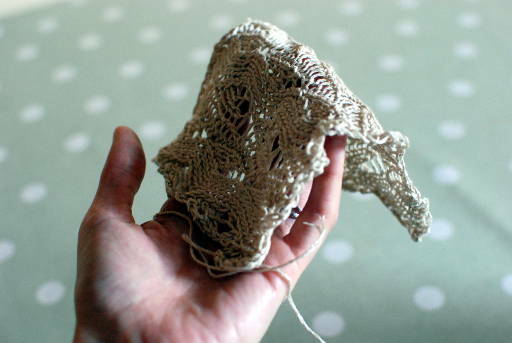 I have been having a bad run of it recently where each neckline I have sewn has fought me every step of the way. 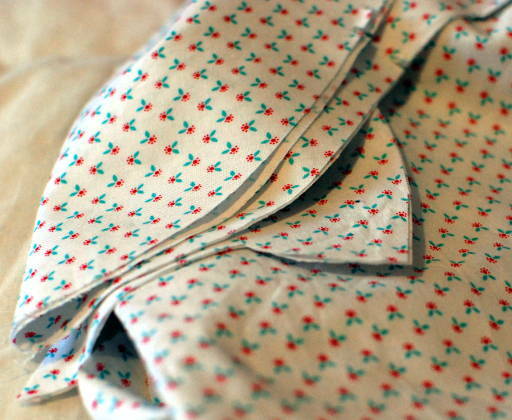 This was no exception: a blouse I have made countless times but the collar stand refused to adapt. Sometimes these things take a very stern talking to. Apologies, my skirt is a little twisted in each of these photos. The pattern for the blouse is the same that I used here. It provides an alternate view that has roughly the same shape but without the princess seams. I think it is a good match for the print (which you can see close up here). What I like particularly about the print is that the flowers are red and teal on a crisp white background so really, I can wear it with a whole lot of different things. I got the fabric from Fabric HQ. It’s not the first time I’ve ordered from them and I highly recommend their service. I ordered this print along with the white fabric I used for my skirt. They emailed to say that they’re not the same colour white, sent photos to compare, and asked if I wanted to reconsider. I didn’t, but it was great that they considered that I might want to match them. The many incarnations of this green silk! 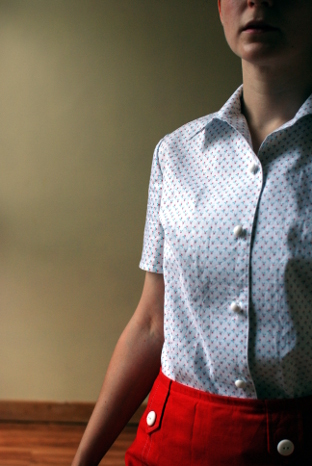 I used it to make the ‘portrait blouse’ from Gertie’s book for better sewing, but the style didn’t suit me at all. Luckily, it didn’t use up much fabric at all and I had enough left over to make this. 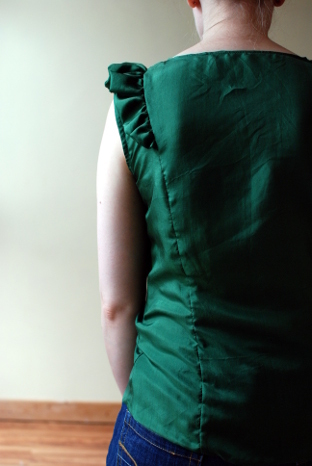 I salvaged the green zip from the previous blouse also. Pattern: Pendrell by Sewaholic. I made this before, this time last year. Fabric: Green silk, kind of like a habotai. I got it in Rubanesque on sale for something like €9/m. For this iteration, I decided to add some of the sleeve ruffles. They were really easy to put in with the princess seams but still time consuming, making the ruffles and making sure they were even throughout. I’m reasonably happy with how my neckline turned out, considering how completely disastrous necklines have been for me recently. I was planning that this be part of my August outfit (with the white skirt I made) but for some reason, the two just do not go together. 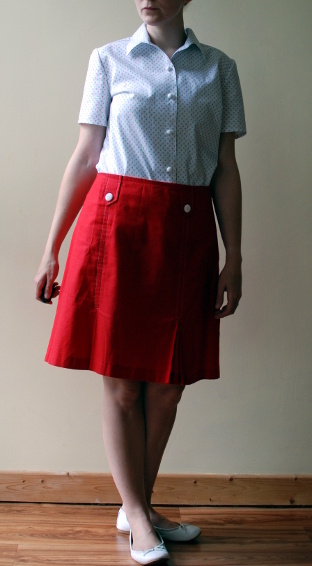 I would have shown the white skirt here but I spilled tea on it so it is going round in the washing machine as I type. Anyway, I think it’s a nice top and something I hope to wear a lot. Switzerland came and went – this was my third time now so it was much, much easier. I know the airports, train stations, town plans, where to eat, where to shop, all the things that take up time and mental energy. As always, we all had a great time. I met lots of new people and made new friends. It was the first occasion I had prepared work pretty much all by myself without much external input so it was rather gratifying to see that work out as I intended. I have some video of my concerto performance but I am still trying to figure out how to extract it from the clutches of my phone! When I do, I will try to find a way to share here. I spent a decent amount of time swatching, mocking up patterns and cutting out. Most of this resulted in the answer, no, this won’t work. I was hoping to get a wearable muslin out of my first Archer shirt but it’s too small across the front. Perfect everywhere else, though, so I cut out a revised version from some light blue chambray I’ve had for a while. I fell foul of two summer sales; one at Fabric HQ where I bought this lovely tiny floral print, currently cut up into a short sleeved blouse…. …and this marvellous white-on-white cotton, which is slowly making its way into the world as a pleated skirt. I would normally have finished this in two sittings but a few things held me up. Firstly, I wanted to have a side zip but also pockets. Although manageable, this takes time. 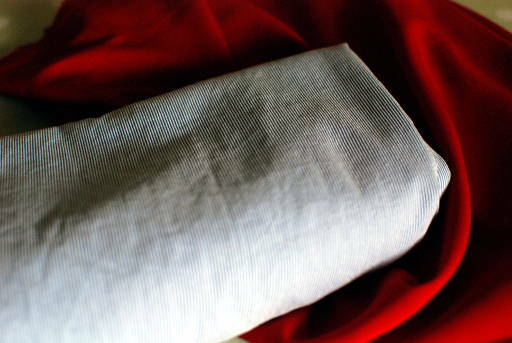 Then, when I was pressing in the pleats, I noticed that the fabric is extremely see-through. I dithered over what kind of lining to use. I could use an acetate, which works well if I wear tights but is horrible against the skin. 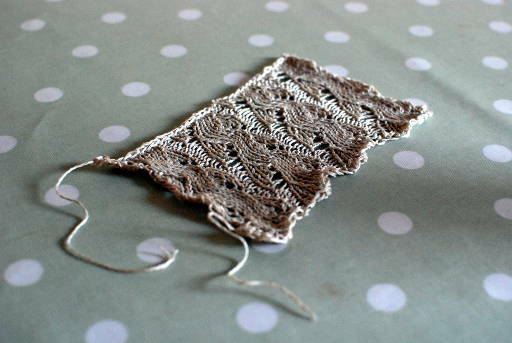 I could use a cotton voile or gauze, which is nice against the skin but sticks to tights. 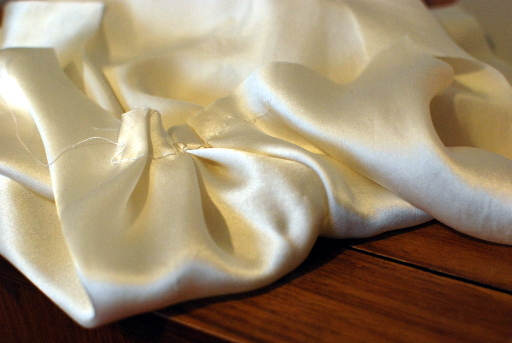 The optimal is silk something but silk satin is very expensive, so what to do? While I dithered, I started working on a green silk Pendrell to go with the skirt. I’m recycling this, which was a bust and I never wore. Anyway, I was in Hickey’s for the second sale I mentioned, when I overheard a funny conversation. A woman wanted to cover lampshades in silk but didn’t want it to be expensive (?!). After refusing many types of silk, the saleswoman dug out some silk habotai lining. At €9.95/m, this was acceptable to the woman. I was standing at the counter with my red georgette, looking at this lining and knew that I, too, had my solution. It’s pretty sheer but it does the job. I hope to show both soon! All they need are hems and hooks and eyes. So, that red georgette. I went into Hickey’s to see what was in the sale. I cannot explain why I always want to make a summer dress in August but here I am again. After much mulling, I decided to go with Hazel because I love the way the shaping in the bodice can be illustrated with stripes. I was after a cotton or linen something with stripes; I found a cotton ticking for about €9/m in the sale. While I was there, I spotted the red georgette. It’s polyester and is like a crepe, with a matt dimpled texture and a really good, grippy drape. I got 1.25m and I am 99% decided on a pattern. …was transformed into a drapey dream. Looking forward to sharing the skirt and top soon!